That your membership in the Kanata Seniors Council gives you access to a variety of technology services? 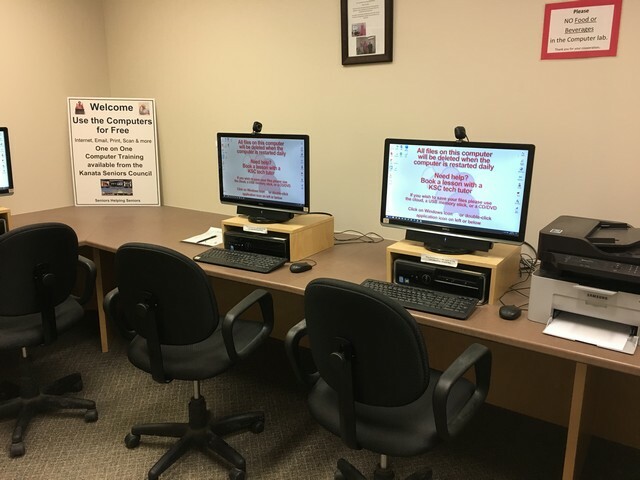 You can connect your computer, phone or tablet to Wi-Fi at the Kanata Seniors’ Centre, or use one of our five Windows 10 PCs for Internet and email access, printing, scanning or Skyping. For your convenience, one PC is equipped with an extra large LCD monitor and larger fonts for better accessibility. Navigating and managing files on your Windows 10, or Apple computer. Setting up and using email. Safely browsing the Web using Internet Explorer/Edge, Chrome, or Firefox, and search engines like Google. Creating documents, spreadsheets, and presentations with Microsoft Office or similar tools. Using social networking tools like texting/instant messaging, video calling, Facebook, or blogging. Finding and loading useful Apps on tablets and smartphones. Making the best use of your eBook reader. Transferring, editing, and managing the photos on your digital camera. Connecting a printer, scanner, or memory stick. Keeping your personal information private and your computers safe from viruses and malware. on the Council’s Computer Training. Kanata Seniors Council provides free Wi-Fi access in the Kanata Seniors’ Centre building. Each room that has Wi-Fi access is identified with a sign similar the one opposite on the door entrance. All members must abide by the Council Wi-Fi Policy (link below). Please see the Front Desk to register and obtain the Wi-Fi password. For help in connecting your laptop, notebook or device to the KSC Wi-Fi Network please see “How to Set Up Your Wi-Fi” (link below). For more information, please see our Frequently-Asked Questions (link below). and we may be able to help, or direct you to someone who can. Seminars on technology topics are provided free to all Kanata Senior Council members who register at the front desk. Each seminar consists of a presentation followed by Q&A. Printed take-away notes are provided. Upcoming seminars are listed on the monthly Kanata Seniors’ Centre Calendar.